Whether I’m on my way to school or work, there are somedays were cafe hits the spot. 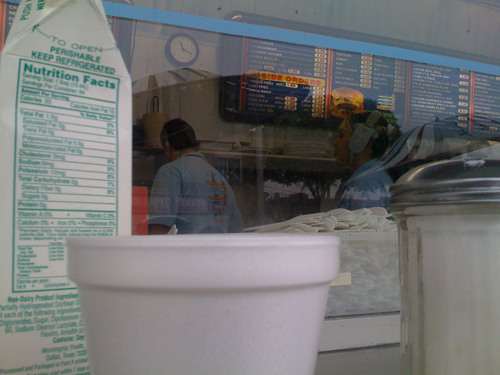 At school, I always have it with pan from my local “El Pavo” bakery and when I’m my way to work, I grab a cup at Jim’s Burgers on First street. I order myself a sunrise burrito with chorizo and have my breakfast waiting or on the bus. I tell ya, on a cold breeze morning, that cup of joe makes my day. It’s no wonder these old timers do the same thing. As I was waiting for my burrito, I over heard them talking to each other about some random topic that I’m sure got them all riled up. They all had a cup of coffee in front of them, black and a carton of smokes in the middle. They have to be some tuff old men to still be drinking black coffee and smoking at their age. Hell, I hope to be able to still walk and form coherent thoughts by the time I get that age too. I shared a brief moment with those old timers. For a second there I was just like them, sitting down, drinking my coffee and reminiscing about the past. A second later I grab my burrito from the order window and rush to get on the bus. All the while taking sips from my morning cafe. This entry was posted in Food, Personal by El Random Hero. Bookmark the permalink. I like seeing the classic seating style like the one the men are sitting at,I rememeber we used to have a mesa like that in the 80’s but my parents had it forever prev ,it was like orange and yellow chairs really retro! we got rid of it but it is prob a vintage item now ha! ha! busted! dude the clock in the background says it’s 11:20. I was reading this picturing a cold early morning like 6:30am or something, I could just feel the cafe warming up my cold hands…and then I took a second look. that means those oldtimers have prolly already put in almost a full day’s shift at that table spot since like 5am…and you need to set your alarm clock for earlier—levantate! na just kidding, that’s just funny. The Sunrise is the bomb, but with chorizo?, you are brave. I like the grilled chicken salad, and the bean, rice, cheese and pico de gallo burrittos. Early in the morn, there is a woman right on the corner there selling champurado and tamales. I was there one morn and the workers inside Jim’s ordered from her instead of eating Jim’s food. El Pavo has the best pan. I visit the one on Figueroa St in Highland Park now and then. 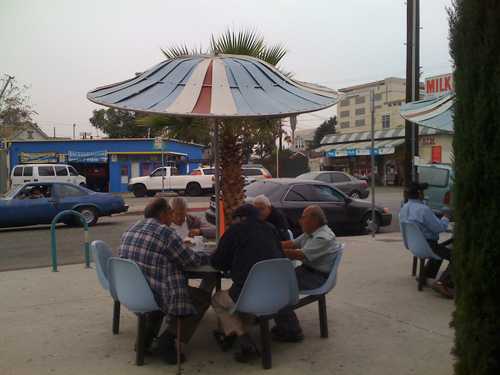 There was this cool KCET web feature on Boyle Heights a couple of years ago and they had audio clips of the Jim’s Burgers regulars. It was really cool, maybe it’s still up?